The New York Aquarium in Coney Island is the only aquarium in New York. With hundreds of different species, the New York Aquarium aims to educate visitors about aquatic ecosystems and encourage them to defend its preservation. Originally located in Lower Manhattan, the aquarium first opened on December 10, 1896. The animals were temporarily moved to the Bronx Zoo when this location closed in 1941. The aquarium reopened at its current location in Coney Island on June 6, 1957. The aquarium is managed by the Wildlife Conservation Society. Their mission is to preserve aquatic wildlife and encourage a respect for the nature. The New York Aquarium is home to hundreds of aquatic species living in replicas of their natural habitats. For example, the sea otters and penguins swim among rocks and trees from the northeastern Pacific. Ocean Wonders: Sharks! also opened in 2018. A large aquarium and information centre, devoted entirely to sharks. 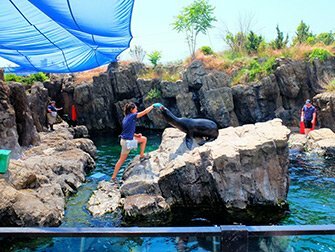 Visit the Aquatheater to see the acrobatic skills of the sea lions. The animals and their trainers perform three times a day. There are volunteers available throughout the New York Aquarium. They are happy to answer any questions you may have. As soon as you enter, check the schedule for the animal’s feeding times. It is very entertaining so be sure not to miss it. Furthermore, visit the 4D theatre in the aquarium which combines a 3D movie with extra sensory effects. 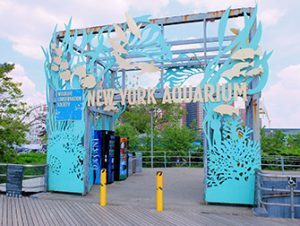 Eric’s Tip: A visit to the New York Aquarium can be combined with a stroll along the boardwalk of Coney Island and a ride on some of the rollercoasters at Luna Park. Don’t forget to try the famous Nathan’s hotdog! After purchasing, you will receive an e-ticket that you can print out as your ticket for the aquarium or show as a mobile ticket on your phone.